Spy Suite is a feature-rich remote monitoring and administration software program that enables you to easily control remote computers. 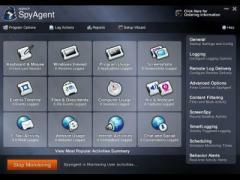 The application enables you to view all the actions performed on the remote computer in real-time, grab desktop screenshots, browse the remote hard disk drives and other related actions. More importantly, you can do all of these things via a web browser on any Internet-connected PC with no need to have a client installed.